Ryan, doing it better than anyone else could. I can think of many ways to describe my son. He’s intelligent, loving, considerate, passionate, handsome, determined. Write a description of yourself that would help someone pick you out of a crowd. There are many differences in me and other people. One difference I have in the way I look is that I usually wear hockey shirts. That’s the biggest difference because I’m attracted to hockey. I also wear glasses, which most people don’t wear. Finally, I’m very tall. Most people are around 4-9, I’m 5-3. These differences will hopefully help you tell me apart from everyone else. Written expression has never come easy to Ryan. There are too many shades of gray, too many squiggly lines to fit comfortably in the perfect grid of his black-and-white world. But thanks to some incredible teachers, who have taught Ryan to break the task of writing down into rules that he can easily follow, he has improved tremendously. His paragraphs follow the same structure, with a topic sentence that typically repeats the question being asked, followed by several supporting sentences to buttress his argument. The last of the almost always begins with “finally.” He then wraps up the paragraph with a concluding sentence that sums up the argument. Over the last year, his writing has gotten less rote and more free-flowing. He is able to structure the arguments himself. The paragraph above was completed with absolutely no assistance. His conclusion didn’t exactly repeat the topic sentence, which is progress and makes his writing less robotic. In the midst of day-to-day difficulties, it can be easy to miss the progress that is happening right in front of our noses. 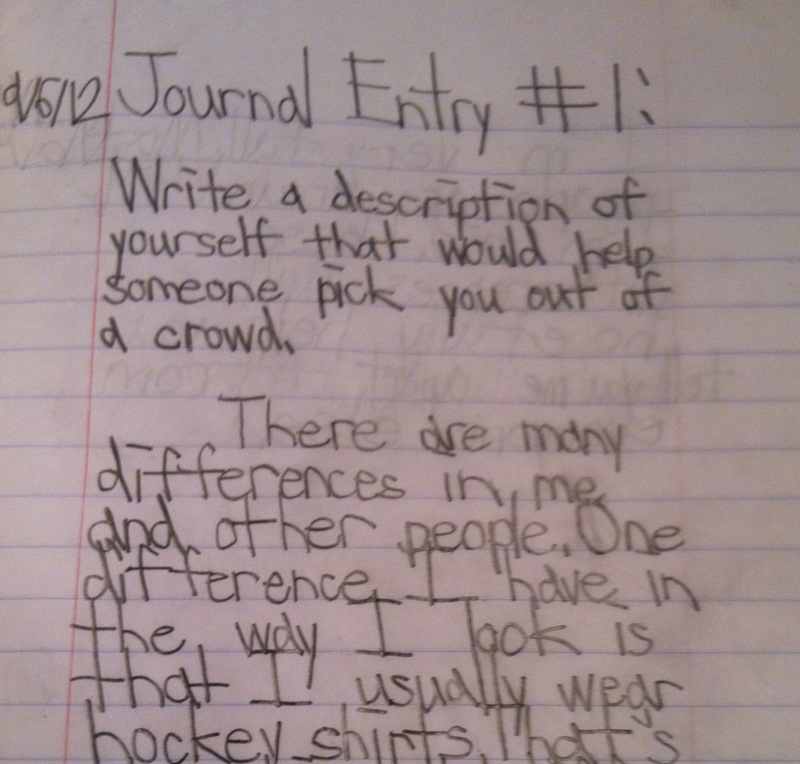 It’s an incredibly pleasant surprise to be smacked over the head with it the way I was when I read this journal entry. He’s come a long way from his attempt to argue why Canada is his favorite place on earth. There will be plenty of academic struggles this year, I’m sure. But Ryan’s first assignment of the new school year proves what he is capable of with the right support. He is capable of showing remarkable progress outside of his comfort zone of math, where he tests way above grade level. He is capable of finding ways to apply rules and structure to disordered subjects so they make sense to him, and then he is able to execute those rules and build on that structure — producing what you see above. To the untrained eye, it’s not much. A simple paragraph that any student his age should be able to produce on command. But we know how much work and effort went into producing that paragraph, and it will never be insignificant to us. That was an amazing paragraph. He did a terrific job, and I can imagine how proud you and your wife must be! I hope Ryan is proud of this accomplishment, too. This post gives me much hope for the future. Thank you for sharing. Based on what I’ve been seeing from some college graduates lately, he’s got a far better understanding of paragraph structure than most. Nice work! that is very awesome! i have been in college classes where the students didn’t grasp the concept of a paragraph so well. we’ve been working with Cameron for years trying to get him to journal. i completely get what a huge deal this is in the way of progress. And there are very few stages in life where this skill is not needed, regardless of career path. congratulations!! Thanks for all the encouraging comments. For those of you still waiting to see this kind of a breakthrough, just know that we were in those shoes for many years. But with diligent hard work to build up his basic skills, Ryan has really made some breakthroughs in the last year. And his hand writing is very nice, too. It makes my heart sing to see him doing to well. I loved the “Give Blood” shirt he wore the first day of school. That was perfect for him and that age group. We had a similar moment when The Boy was assigned 5 pages of math homework the other night — I panicked, but he handled it like he had been doing math homework every night of his life. Such a pro! Thanks for commenting. Just read a few posts on your blog – good stuff. I’ll be adding it to my follow list for sure.